^ Hugman, Barry (编). The PFA Footballers' Who's Who 2005/2006. Queen Anne Press. 2005: 180. ISBN 978-1-85291-662-6. ^ Players: Goalkeepers: Joe Hart. Manchester City F.C. [20 November 2013]. 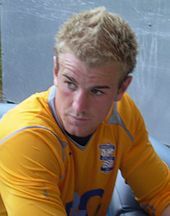 ^ Player profile: Joe Hart. Premier League. [20 November 2013]. ^ Shrewsbury 1-1 Gravesend. BBC Sport. 2004-04-20 [2009-06-29] （英语）. ^ Morecambe 3-3 Shrewsbury. BBC Sport. 2004-04-24 [2009-06-29] （英语）. ^ PFA Fans' Player of the Month Awards for January 2006. givemefootball.co.uk. 2006-02-07 [2009-06-29]. （原始内容存档于2007-04-28） （英语）. ^ Gerrard named player of the year. BBC Sport. 2006-03-23 [2009-06-29] （英语）. ^ Hunter makes two changes. thefa.com. 2006-05-15 [2009-06-29] （英语）. 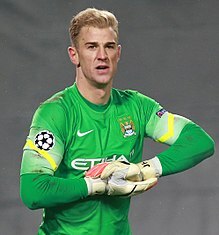 ^ Goalkeeper Hart to join Man City. BBC Sport. 2006-05-22 [2009-06-29] （英语）. ^ Man City 0-0 Sheff Utd. BBC Sport. 2006-10-14 [2009-06-29] （英语）. ^ Tranmere sign City keeper on loan. BBC Sport. 2007-01-01 [2009-06-29] （英语）. ^ England U21 2-2 Spain U21. BBC Sport. 2007-02-06 [2009-06-29] （英语）. ^ Huddersfield 0-2 Blackpool. BBC Sport. 2007-04-09 [2009-06-29] （英语）. ^ Swansea 3-6 Blackpool. BBC Sport. 2007-05-05 [2009-06-29] （英语）. ^ FA names 30-man England U21 squad. BBC Sport. 2007-05-10 [2009-06-29] （英语）. ^ Cardiff seal Schmeichel loan deal. BBC Sport. 2007-10-25 [2009-06-29] （英语）. ^ Man City 3-1 Newcastle. BBC Sport. 2007-09-29 [2009-06-29] （英语）. ^ Chelsea 6-0 Man City. BBC Sport. 2007-10-27 [2009-06-29] （英语）. ^ Portsmouth 0-0 Man City. BBC Sport. 2007-11-11 [2009-06-29] （英语）. ^ Micah Richards column. BBC Sport. 2007-11-13 [2009-06-29] （英语）. ^ Newcastle 0-2 Man City. BBC Sport. 2008-01-02 [2009-06-29] （英语）. ^ England U21 5-0 Slovakia U21. BBC Sport. 2007-06-05 [2009-06-29] （英语）.